﻿ Is Classical Dressage Something New? The answer to this question is as simple as the answer to the next. Like the wheel, Classical Dressage cannot be reinvented - it is as old as the hills! How therefore could I ever make such a claim? Seriously, there is no new system. Those people who trade on their own names to promote something, which was discovered, practised and written about hundreds of years before the birth of Christ can best be described as good salesmen and women. Podhajsky didn't teach the Podhajsky Method, Oliveira didn't teach the Oliveira Technique....although attitudes and interpretations may change, all bowed to the wisdom of the past! Classical Dressage - What's In It For Me? 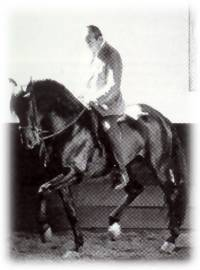 The Sylvia Loch Classical Dressage System - Why It Doesn't Exist?